LAWRENCE, Kan. — Two of the Big 12’s most powerful offenses collided when No. 8 Kansas hosted Oklahoma. Only one lived up to the hype, though. Devonte Graham had 23 points and seven assists, Malik Newman added 20 points and No. 8 Kansas beat Oklahoma 104-74 on Monday night in its first true blowout of the Big 12 season. “It was a fun night, a good win,” coach Bill Self said. “Certainly we needed a game where we could not sweat until the very, very end.” The Jayhawks (22-6, 11-4 Big 12) controlled things early, jumping out to a 10-0 lead less than four minutes into the game and forcing Oklahoma coach Lon Kruger to burn a timeout before the first media break. The Sooners (16-11, 6-9 Big 12) never recovered. “From the start, seemed like we were fighting uphill all night,” Kruger said. “Just hanging on to stay within range. Guys fought it pretty good for a while, obviously didn’t finish it like we want to or need to.” Kameron McGusty led the way for Oklahoma with 22 points while Jamuni McNeace added 18 in his first career start. It was a cold shooting night for Trae Young, who missed 10 of his 13 shots and had a career-low 11 points. He led the game with nine assists. Six Jayhawks scored in double figures, and the team broke the 100-point threshold for the first time since December. It was an offensive performance unlike any other during their Big 12 season, fueled partially by the memory of their loss to the Sooners in Norman back in January. “The only the thing that was on our mind was just getting payback,” Newman said. “We went down there, and they stole one from us.” The win marks No. 300 all-time in Big 12 play for the Jayhawks. Only two other schools (Texas, Oklahoma) have surpassed the 200 mark. NEW LOOK SOONERS Kruger made a drastic change to his team’s starting lineup, replacing three starters before tonight’s game. Only Young and Christian James remained from last game’s starting five. “We lost a few in a row,” Kruger said. “We’re just searching. 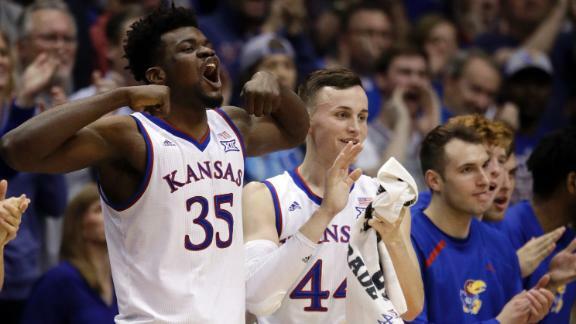 We’re just trying to get some sort of spark.” DAWN OF DE SOUSA Silvio De Sousa had the first notable performance of his Kansas career, scoring 10 points and grabbing six rebounds in just 13 minutes. He’s struggled mightily in his sparse playing time, as early graduation allowed him to enroll at the semester break while he should be a high school senior. “Tonight he was poised, he took his time on the post,” Self said. “You compare that performance and at OU, where he had three turnovers in one minute and everything, and it’s night and day.” INTO THE RAFTERS Former Kansas point guard Sherron Collins had his jersey retired at halftime, making him the 33rd player in program history to receive the honor and the second in the last three days, after teammate Cole Aldrich had his number raised Saturday. Collins ranks No. 5 all-time in scoring at Kansas with 1,888 points, and No. 9 in assists with 552. In 2010, he was named a consensus first team All-American, and was the Big 12 sixth man of the year on the team that won the 2007-08 national championship. BIG PICTURE Kansas now sits a half-game ahead of Texas Tech atop the Big 12 standings after gaining a game on the Red Raiders when they fell to Baylor Saturday. Oklahoma has now dropped its last six games, and has fallen to No. 8 in the Big 12. The skid has led some to speculate that the Sooners could miss the NCAA Tournament. UP NEXT Kansas has a road clash with Texas Tech Saturday, serving as a battle for the outright Big 12 lead. Oklahoma will look to rebound at home against a hot Kansas State team on Saturday.